While I like my coffee with just milk and sugar, you guys might enjoy this. After a quick Google search, this “secret” menu has apparently been making its rounds in the interwebs. I’m just not sure if they’ll accommodate these here in Manila. 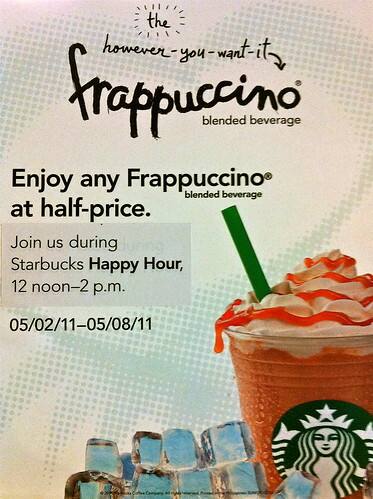 From May 2 to May 8, between 12nn and 2pm, enjoy your favorite Starbucks Frappuccino at half the price. I don't need no stinkin' planner! Always drink label side out for maximum status symbol effect!